Eggs from a mosquito (image courtesy Fabrizio Montarsi). As a small animal practitioner you know its Easter when you get calls about dogs raiding Easter egg stashes. I met two unfortunate pugs yesterday who happened upon a bag containing Cadbury chocolate-mousse filled Easter Eggs. They couldn't believe their luck and although the bag was placed out of reach, they were able to reach the handles and work together to pull it down and open its forbidden contents - which were naturally gorged rapidly. They presented to me shortly after, and I had the joy of inducing vomiting and confirming that yes indeed, the eggs had certainly been ingested, but looked a lot less attractive on expulsion. I felt very sorry for the pugs as they came into the clinic looking particularly chuffed and were clearly on the hunt for more treats. Those warnings about chocolate toxicity that vet clinics release around Easter aren't empty words! But on the topic of eggs I thought about some of the happier (or in some cases more interesting) egg moments I've experienced, so this post is more of a photo album of egg-related incidents. This chicken presented straining to lay an egg (egg-bound). After treating her I took her home and watched her - and in the morning she produced this in my bathroom. 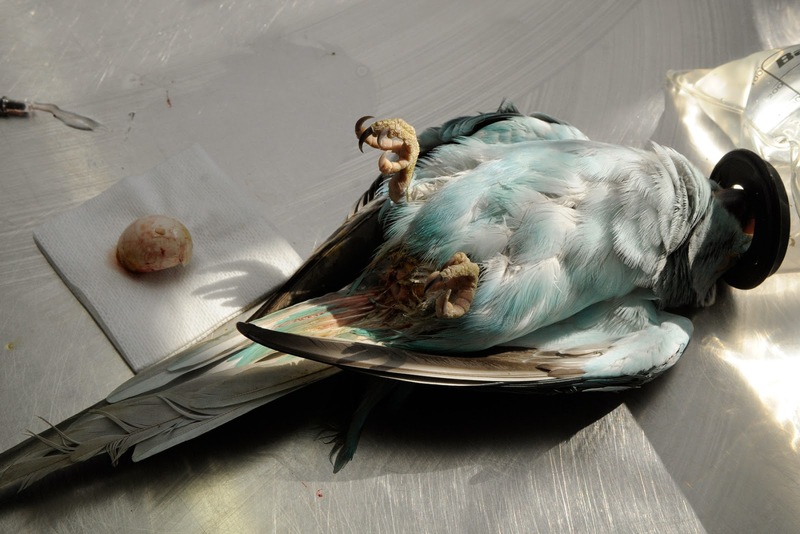 Warning - this pic below looks distressing but the bird is anaesthetised (note mask over head and beak area) and is in this position because she is unconscious. She made a full recovery. My colleague Steve removed this egg from an egg-bound Indian ringneck. If you don't, or you don't do it right, you can cause egg peritonitis which can be fatal. 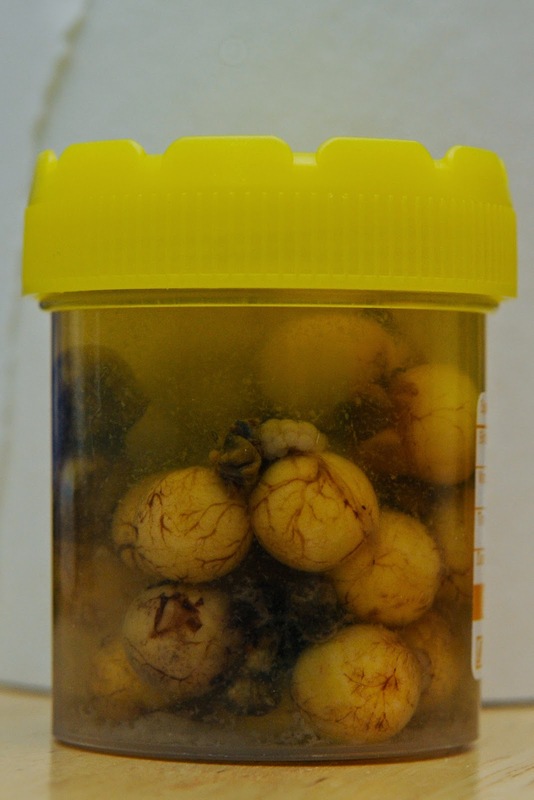 The eggs below were removed from a bearded dragon with follicular stasis, a condition commonly seen in these reptiles. 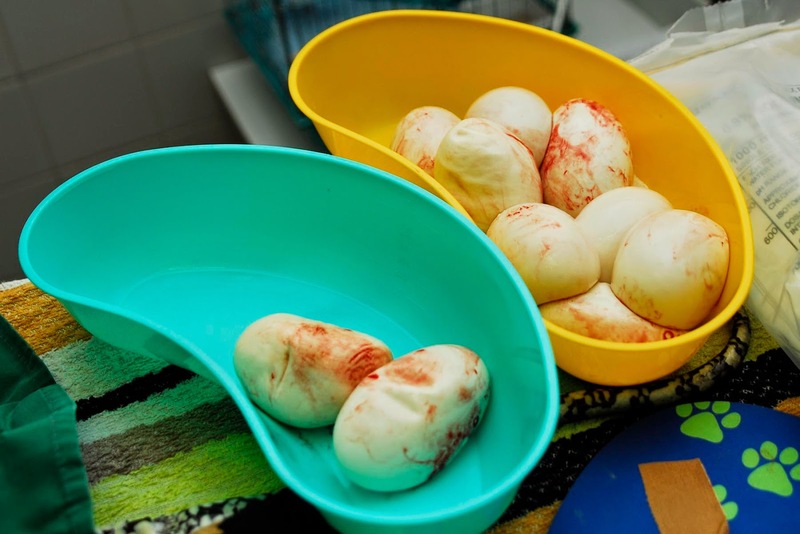 Bearded dragon eggs that have been surgically removed. The above image does remind me of gall-stones. When I was growing up - before the advent of the internet and pay-TV [it wasn't that long ago, kids!] - the best thing at school was show-and-tell. I am not sure if it was peculiar to my school, but one of the highlights was when kids used to bring in their parents' gallstones for show and tell - in the same yellow specimen jars. The stones were about the size of those eggs, and sometimes there were a few. I was so jealous that my parents didn't have gallstones to show and tell. Now I know where they come from and how much pain they can cause, I'm happy my folks didn't have them (I'm also somewhat relieved that mum didn't have follicular stasis, although an egg-laying mum would have blown everyone else's show and tell out of the room). But back to follicular stasis, this happens when fertilised follicles become stuck, usually when active ovaries develop mature follicles that fail to ovulate (preovulatory follicular stasis or, for those in the business, PFS - very different to PMS). 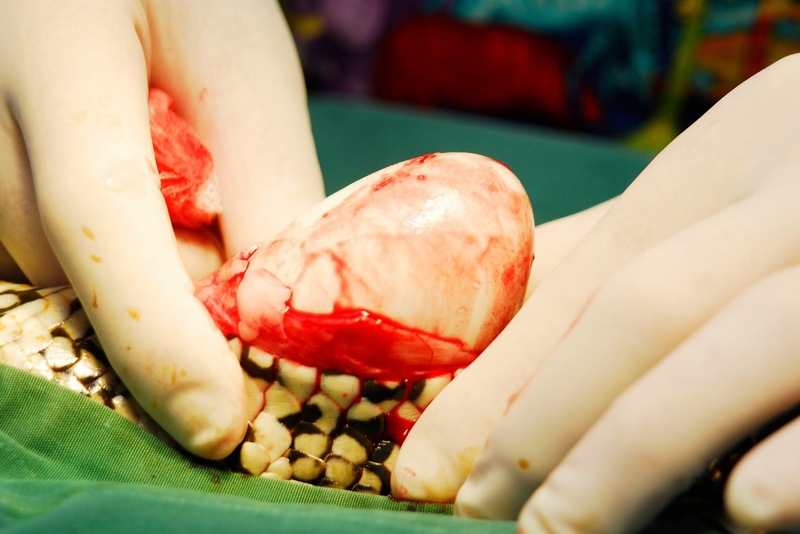 Treatment involves surgical removal of the eggs and speying. You can also get post-ovulatory follicular stasis (also PFS - some potential for confusion here), where eggs just stick together because they are not properly calcified - this creates a massive conglomeration of eggs that is impossible to pass. Treatment is the same. 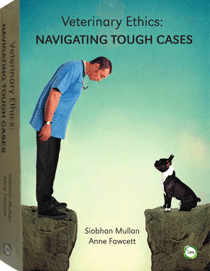 (For more info check out Robert Johnson and Brendan Carmel's fantastic book here). Snakes can also become egg-bound and may require surgical intervention. 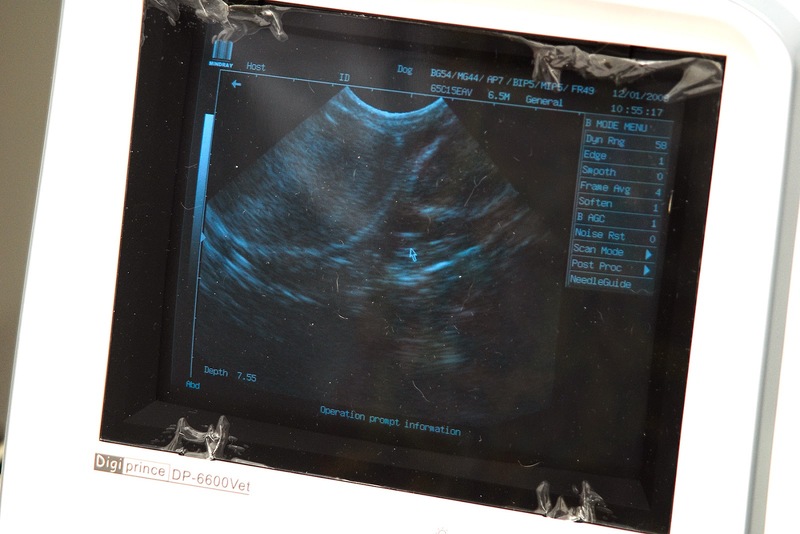 Ultrasound of a gravid carpet python (the outline of the eggs is visible, with two eggs here - one on the left, the other smaller egg is to the right). 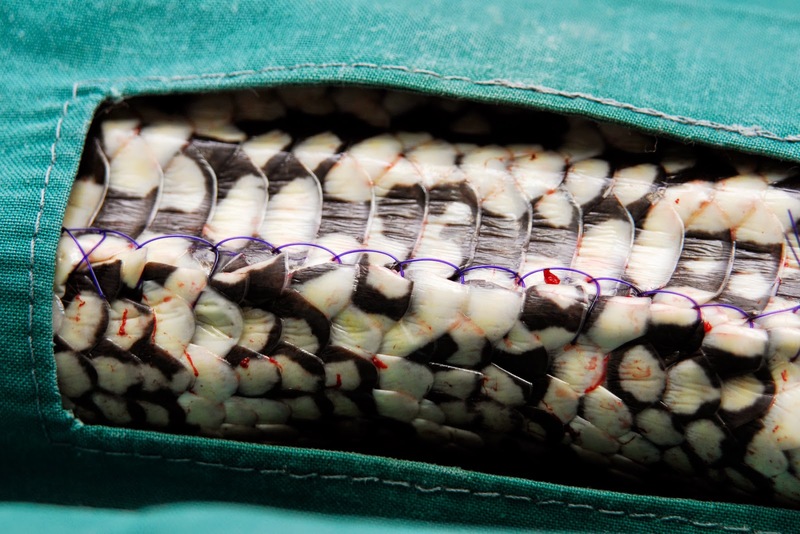 For those readers who aren't keen on seeing images of surgery or reptiles, apologies - there are some pics of python surgery coming up. Dr Robert Johnson removed an egg from an egg-bound carpet python. This python had a lot of eggs that she couldn't move. This is a selection of the eggs. Note their irregularity and very soft shells. 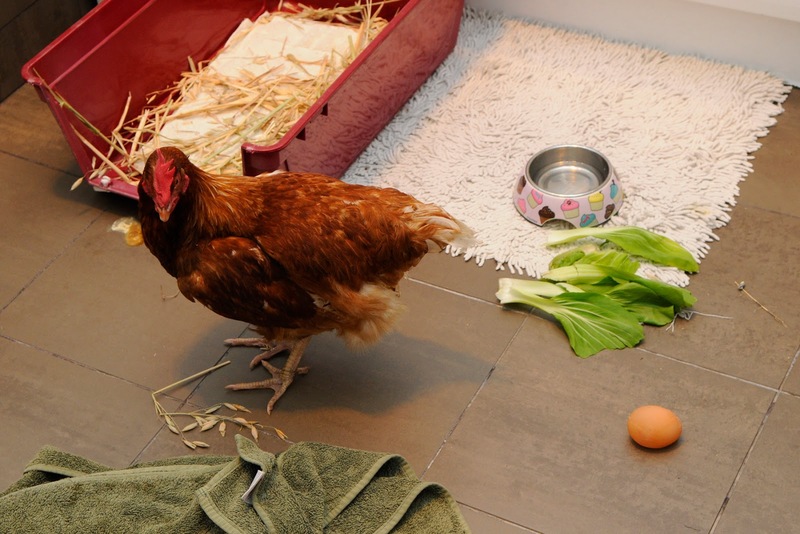 The patient made a full recovery but her eggs were nonviable. Her wound post-op looks very neat. Note that one doesn't incise through the middle of the ventral scales - always try to incise between. So there you have it. Eggs in all of their raw beauty. The chocolate ones just don't really compare, do they? Carmel B & Johnson R (2014) A Guide To Health & Disease in Reptiles & Amphibians. Burleigh, QLD: Reptile Publications.